English to French translation services are extremely important across a variety of industries and professions – but perhaps none more so than the medical profession. Medical errors are something that every practitioner of medicine wants to avoid. Improper treatment or procedures could lead to a patient becoming seriously ill or even dying. Unfortunately, incidents such as this can happen every day when a medical tourist arrives at a hospital and their documentation is in another language, with no translations. Or when instructions for usage of a medication has a poor translation from English to French via an unskilled language translator. The above is not just scaremongering – bad translation happens. Throughout the world, poor communication and documentation brought about by translation errors happen every day and with deadly consequences. Not only that, but if someone were to translate English to French when it comes to the name of a medication, they may inadvertently translate it with a name in a translation dictionary that is similar to something already in the market. This is also considered a medical error. In fact, the School of Public Health at the University of California, Berkeley performed a study into claims of malpractice made to an insurer that covered four States in America. They found 2.5% of the total claims reviewed were brought about by some sort of translation issue that had a direct, or indirect, impact on the patient's well-being – costing the insurer millions. Due to the multi-cultural lives, we lead today, many people of different languages live together. For example, there are over 1.2 million retired Brits living in Europe. However, if medical complications arise with some of these people, the words or phrases in their medical history are going to be recorded in English. For a French practitioner and the English-speaking provider of these documents, this poses a translate problem. 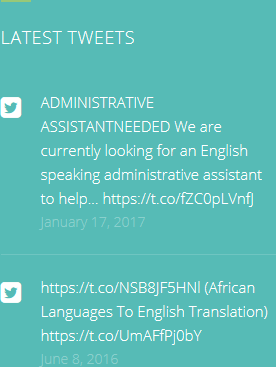 In order for this translation problem to be sorted, they will need a language translator – more specifically, English to French translators. Even if English to French translation services are used, that may not be enough to rectify the translation problems. After all, if the translation is bad, this still leaves medical practitioners culpable. This is what can happen when poor or cheap English to French online translator software download tools are used. The root of the problem may not be just in the translation of medical records and such; but it can also happen at a much earlier level too. Poor translation of dictionary words or phrases in research papers, training manuals for doctors and students, reviews, conference materials and so on can all lead to improper knowledge being passed on and accepted as fact. Or what if the documentation that comes with equipment or tools has a poor translation within? These problems aren't just because of the usage of poor English to French translation Google tools or even cheap translation services – they can also happen because the translator doesn't know about medicine. A translator can have years of translation experience under their belt, but have they studied medicine in particular languages or dialects? Or have they even studied medicine at all? If not, particular phrases or words may receive incorrect translation leading to major complications. For this reason, no chances should be taken when it comes to translation of any medical documentation. But, how do you find a translator that can clearly and efficiently translate medical terminology? Simple: you just get in touch with the professional translation service at HQ-Translators. But why HQ-Translators? A good question and one we're happy to translate to you. For a professional language translator to work with us, they need at least five years of translation experience. They will only translate into their 'mother tongue' or native languages. When we translate medical documentation, we collaborate with experienced doctors and healthcare specialists. So, these are people with experience, people who live in the target country of your dictionary translation and people who have worked in the target country's healthcare system. They're also very good at what they do – which is why HQ-Translators has performed accurate translations of countless medical files, patient reports and so on. 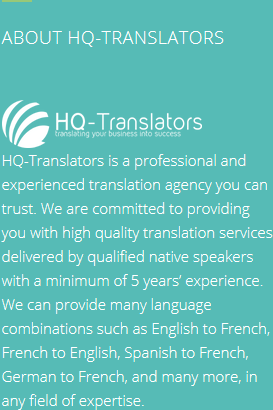 To find out more about our English to French translation medical translator services, just call (00 237) 242 71 38 38 or email infos@hq-translators.com. 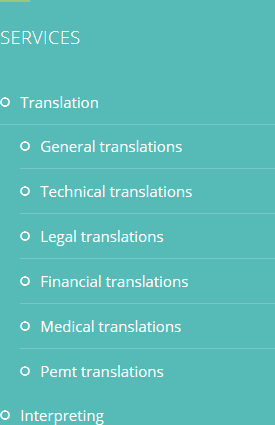 For more on HQ-Translators and our professional translations service, including German, Portuguese, Italian, and Arabic, visit https://hq-translators.com now.